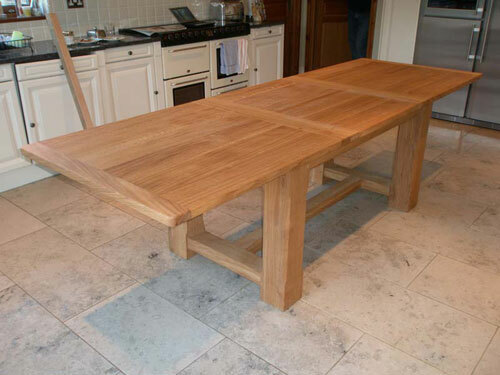 Jameson Joinery manufacture bespoke joinery to traditional and contemporary designs. 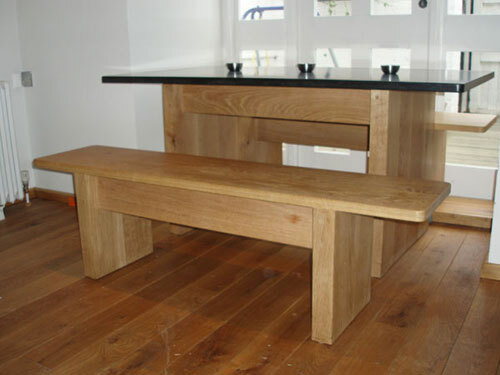 Although the majority of the company's commissions are in Oak, work is undertaken in any tiimber. A full design facility is available where working drawings are produced for a client's approval before work commences. 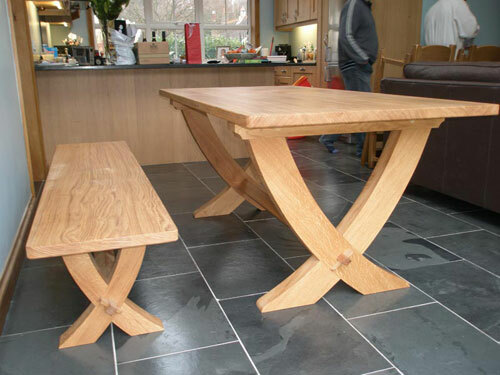 Furniture, Jameson Joinery is a furniture manufacturer company for corporate or private clients in the UK Sussex including London, Brighton and all the other surrounding areas. 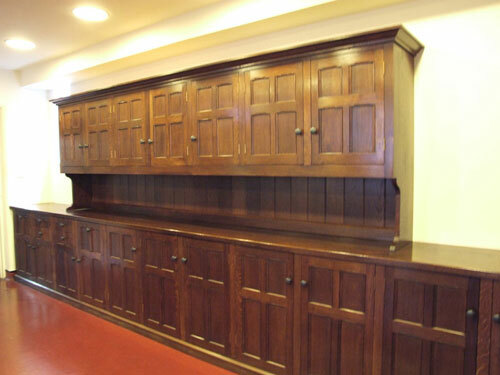 A 5.5 meter long Oak dresser buiklt with moulded panelled doors for a Monastry refectory. 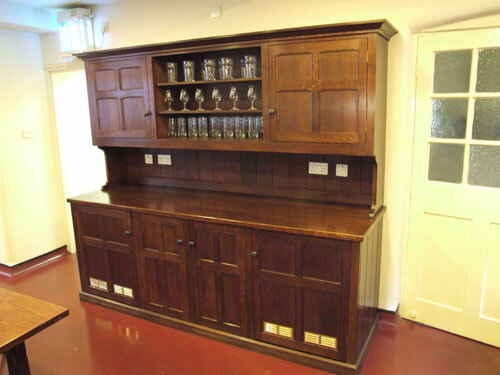 A glass storage cupboard with built-in fridges below. 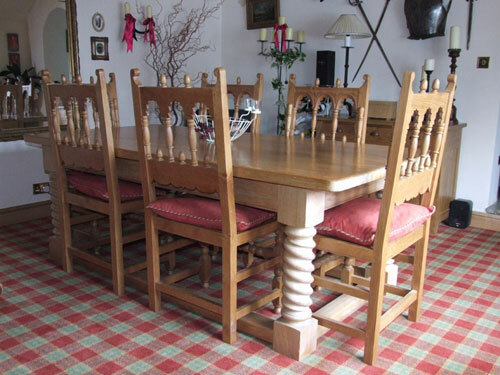 An English Oak refectory table 8 feet by 4 feet with hand carved barley twist legs together with a set of six hand carved chairs. 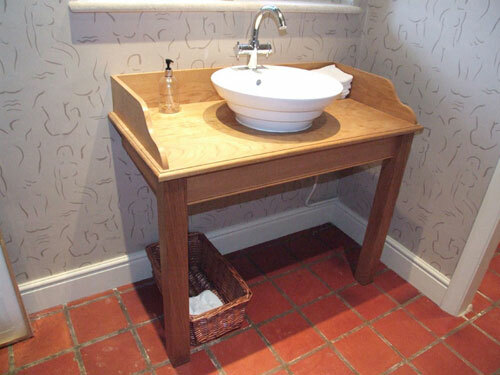 A small oak cloakroom vanity unit. 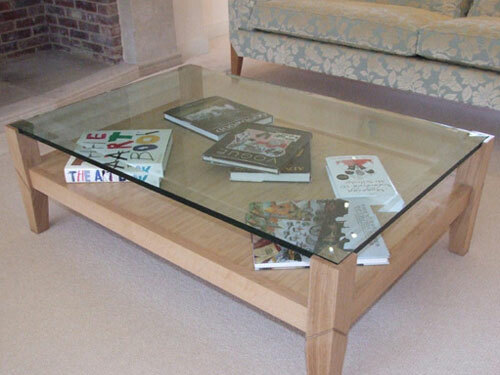 A contemporary coffee table with a 16 mm thick flush mounted toughened glass top made to match existing furniture. 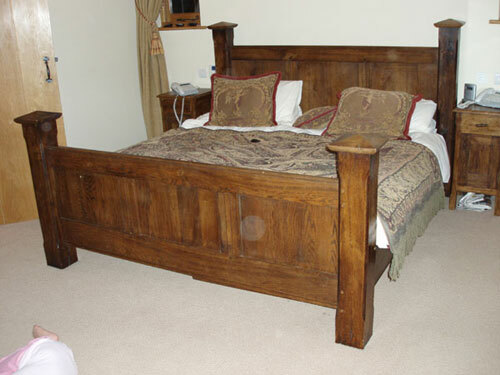 An Oak bed made with panelled head and foot boards and 160 mm square legs, together with matching side tables. 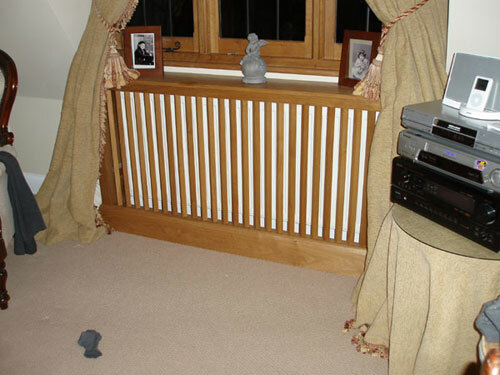 A radiator cover with diamond set mullions. 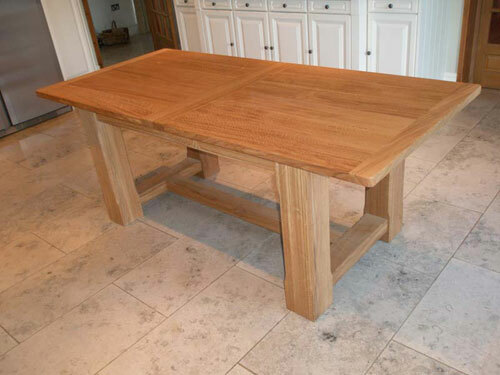 A French Oak dining table with matching benches, the table having a honed granite top. 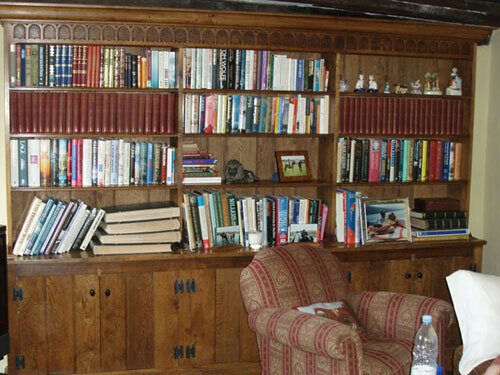 An English Oak bookcase with a carved pelmet. The hinges and knobs were hand made in our forge. A contemporary German Oak stereo housing ventilation is provided by using grills for the base and shelves and an open back. This first picture of the table shows the table in the closed up position. This picture shows the folding geometry of the inner leaves which hinge away under the top when not required. Runners can be seen which enable the outer leaves to be closed effortlessly. 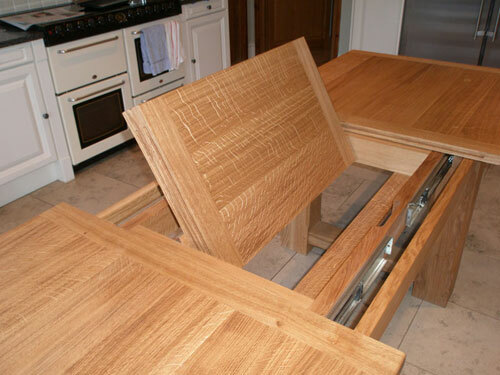 This picture shows the opened out position of the extending Oak dining table. 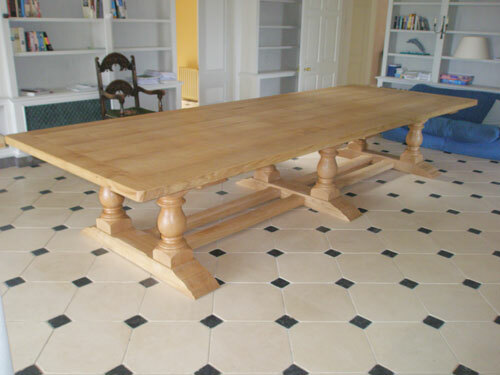 This is a cross legged oak table with matching benches. 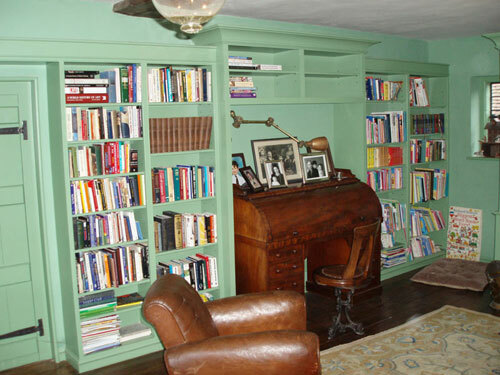 This library is made from painted hardwood with adjustable shelves resting on wooden pegs located in holes drilled into the standards. 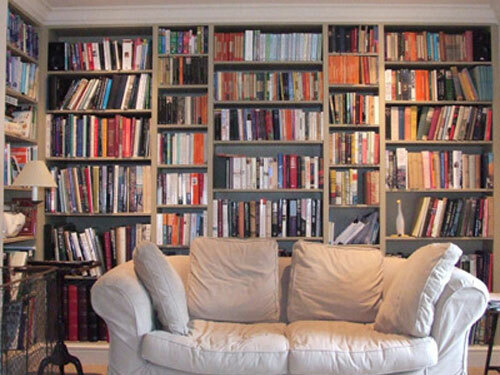 The library is stepped outwards and upwards throughout the room to break-up the monotony of the shelving. 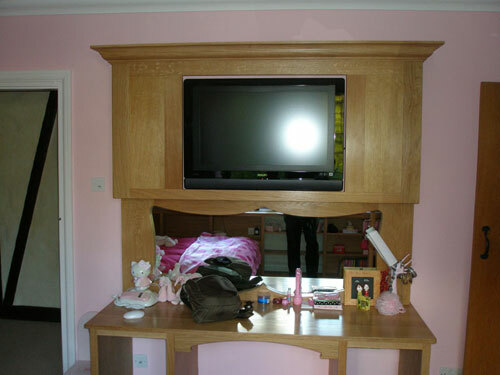 A contemporary child's dressing table with a television housing over. A full height library built with a variety shelf widths and depths of adjustable shelving. 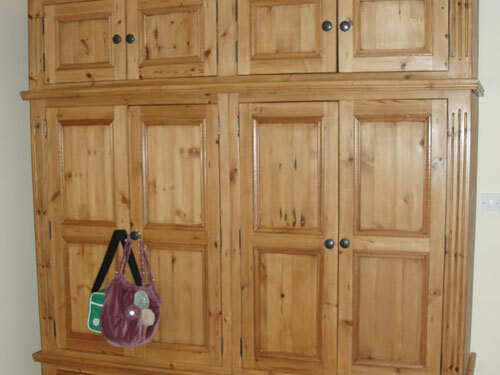 A freestanding pine wardrobe with a hand carved finish. 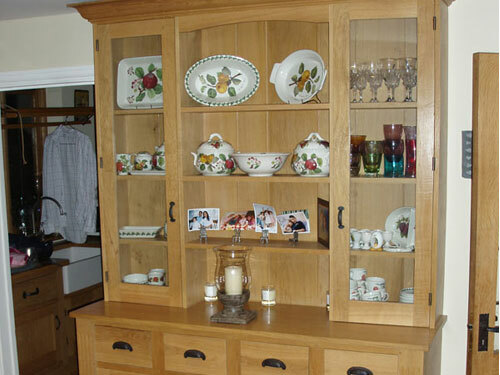 A free standing oak dresser with iron 'D' handles and glazed upper doors. 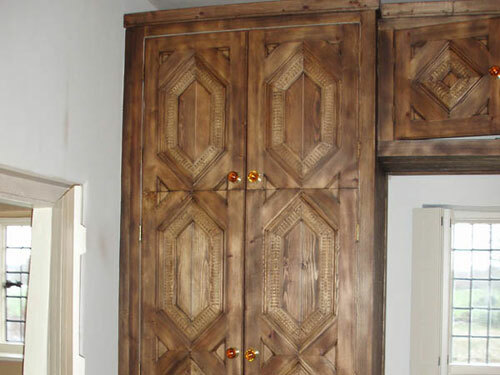 This fitted wardrobe was commissioned to match existing furniture in a grade 1 listed Alms house. The hexagonal panels are hand carved. 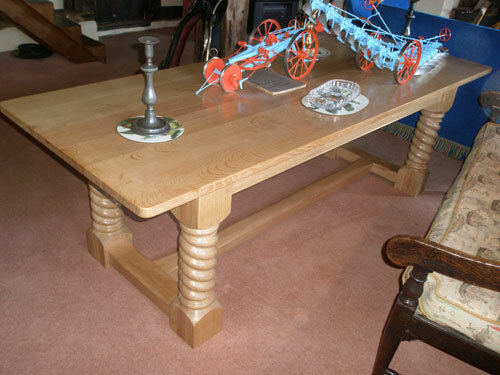 A twelve foot English Oak refectory table which is supported on three legs with cruciform feet. This allows free movement of the chairs. 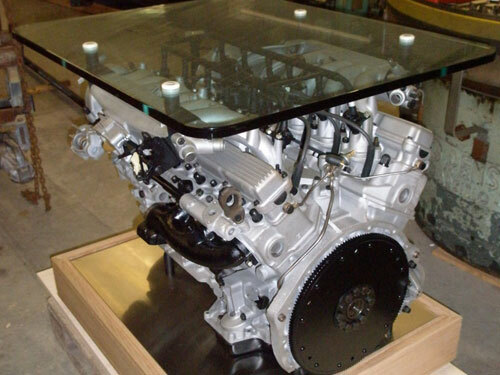 This table was commissioned for a Jaguar car enthusiast. The V12 engine is fully sectioned and rotates to show the internal workings of the engine. The aluminium castings are finished by blasting with glass beads, whereas the steel and iron components are chemically blacked to form a very contrasting colour. The fixed glass top is 20 mm thick. 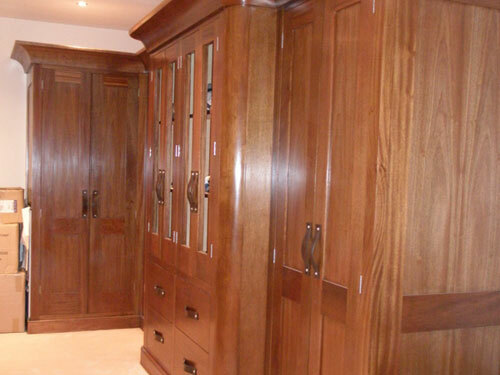 This picture shows lightly finished Mahogany wardrobes. The unique design encorporates 150 mm radiased corners and radiased comices. The handles are hand stitched leather, and the central doors are glazed in hand made cylinder glass. 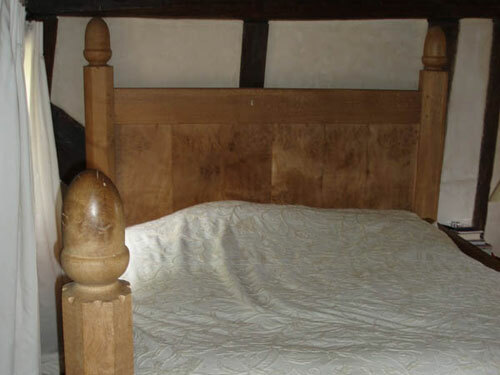 This medieval design of bed is made from English Pippy Oak with one piece hand turned hexagonal posts. The whole bed has a hand edged finish and is entirely held together by dowels. The mattress is supported by a woven sisal ropes threaded through the framework of the bed. These are tensioned to give a flat support - hence the expression "sleep tight". 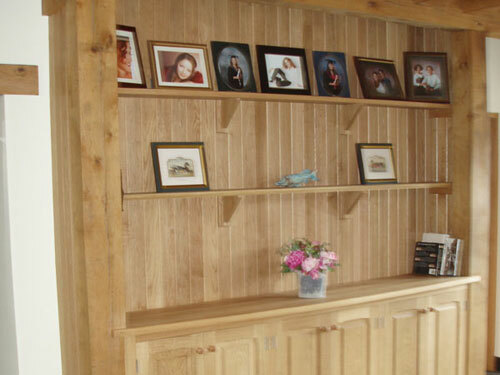 This bookcase is fitted between two structural posts of a new green Oak building. 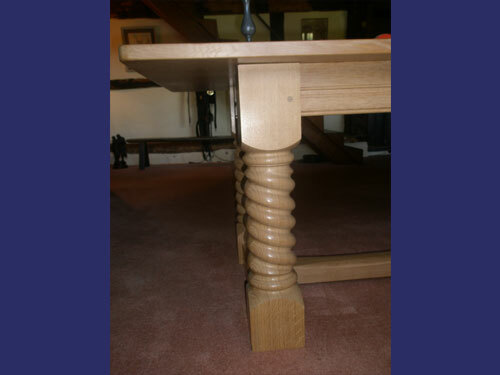 The barley twists on this table are carved by hand, the joiner starting by cutting a helix with a tenor saw and then carving the finished sections with a series of chisels and gouges. 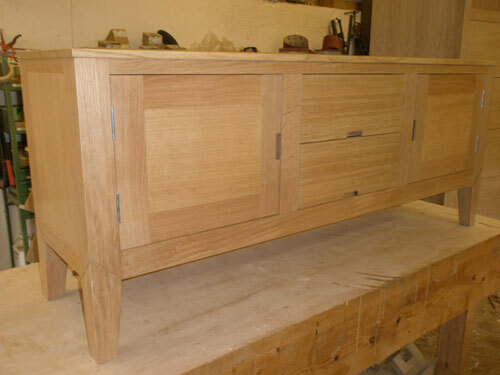 Same as the previous table showing the figuring in the quarter sawn oak top can be clearly seen. 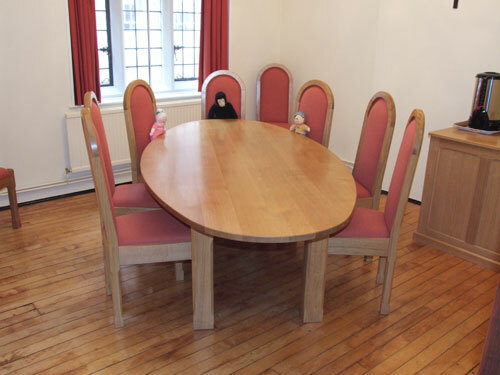 An eliptical Oak table with a set of ten upholstered Roman back chairs for a small conference room. 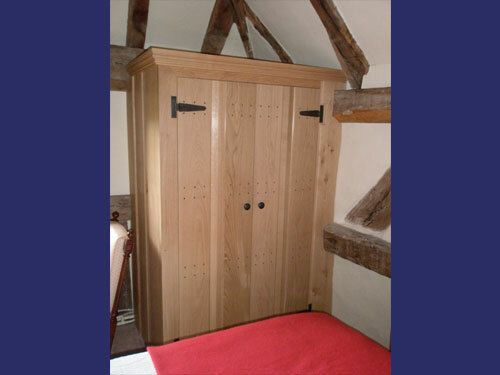 A small built-in wardrobe scribed to the beams of a timber framed cottage. The doors are assembled with rosehead nails. 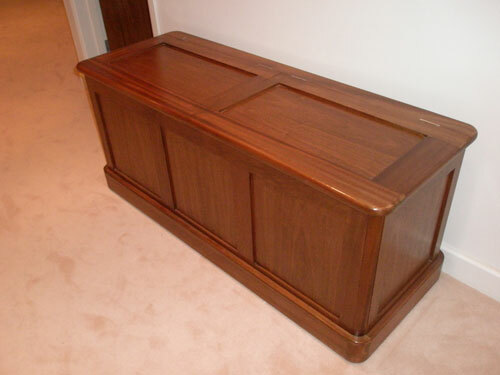 This "dirty washing" box is made from Mahogany. The top is divided into two to provide "his" and "hers" departments. The corners of the posts and the plinths are radiused. 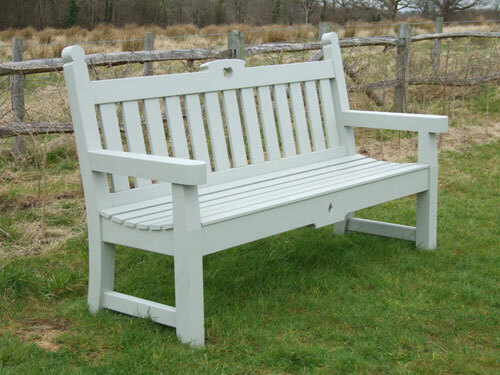 This rather grand bench seat has been made twice full size so that it appears more in proportion when viewed at the end of an avenue of trees. 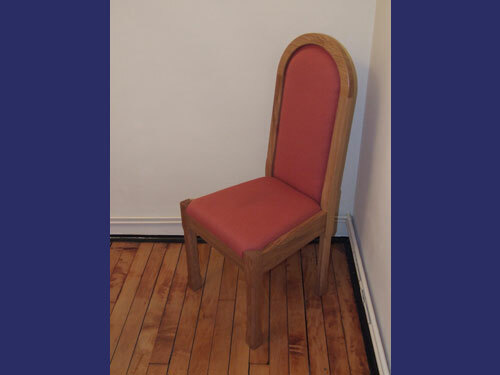 A Roman back oak chair. 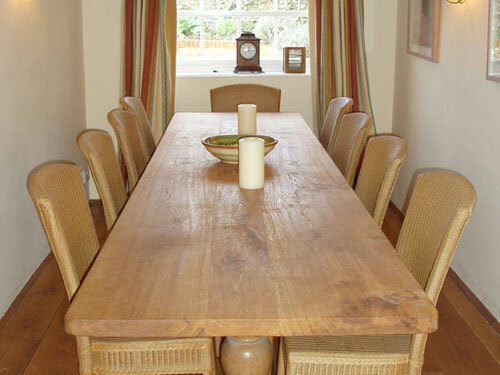 This six legged 14 foot by 5 foot English Oak refectory table has a 2 1/2 thick top, the boards of which are held together by slip tenons secured by draw-bored dowels. The hand turned 9" square legs are cut and then dried for 25 years before being turned. The legs have double tenous to form a stronger joint. The table weighs just under 3/4 of a ton. 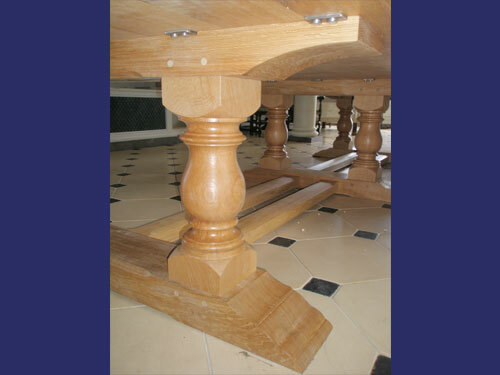 A detailed view of the legs of the table in the previous photograph.